1971, Ted's Birthday @ JB's Electric Shop. March 1971, Celebrating Ted's 51th Birthday at the Electric Shop at JB. 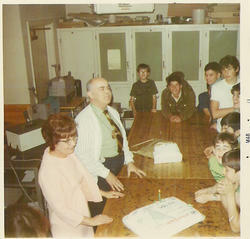 Ted's 51th birthday was celebrated at John Burroughs Jr. High School in electric shop in March 1971. Ted's wife, Florine Ryan, WB6UDJ, and his so, Roger Ryan, ##6### came to celebrate. Note - These are the only known pictures of electric shop from this era. If you have anymore, please share them. Ted, Principal and Dean of Boys. Birthday boy Ted Ryan, WB6JXY, Ms. McDermott, Principal, and Mr. Arthur Wardle, Dean of Boys. 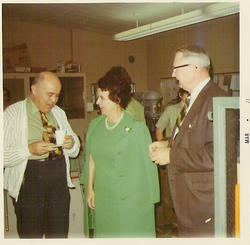 Florine Ryan, WB6UDJ (wife), Ted Ryan, WB6JXY.